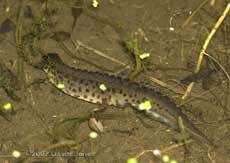 1 April - I can confirm that the newts certainly are egg laying. I saw several today, and also one developing egg that must have been at least four days old. I only took one pond picture today, and that was a bit too far out for comfort, and with the lens only a centimetre or so from the surface! 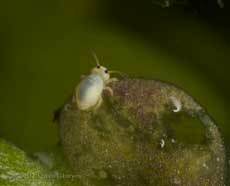 It is a tiny springtail called Sminthurides aquaticus which is common in most of England (although not in the southwest). The females can measure up to 1mm in length, with the males half that size. Needless to say, you do need to get rather close to the water before you start to notice these little creatures. 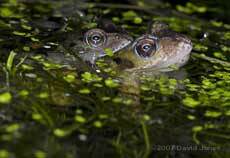 2 April - Just a quick look at the pond tonight, at around 9.30pm, and for the first time this year I found newts hunting amongst the tadpoles. There were ten of them busy catching tadpoles but this was the only picture I managed to get that showed one in action. 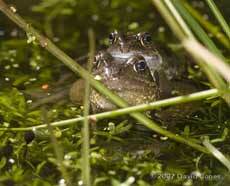 I could also see two females that may have been searching for suitable plant leaves to lay eggs on. I'll watch out again tomorrow night. 6 April - On a sunny day the frogs were croaking and I was surprised to see this pair in a tight embrace that was still in place some hours after the photograph was taken. I would be very surprised to see spawn appearing this long after the 'main event'! 12 April - (large images to be added tomorrow) - There is no sign of new spawn, but I have seen a pair of frogs in an embrace each day since that last photograph. This photograph was taken last night, and I think this is actually a different couple to those featured in the previous picture. 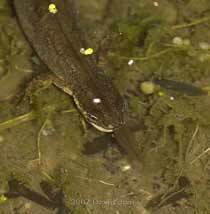 The newts are still feeding on tadpoles, and last night I counted eighteen newts in the shallow end of the pond, two of which were dragging Pea-cockles along with them. This first male has one on a front foot, but it doesn't seem to badly hinder its ability to swim in open water. 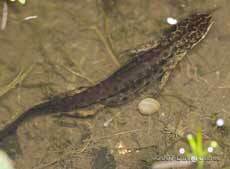 This second male has a large cockle on a rear foot, but it doesn't prevent it from stalking tadpoles. Notice the well developed crest of a male in breeding condition. 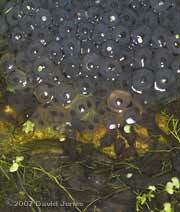 13 April - We have Frogspawn! The embraces of the last six days have been rewarded with a single clump of frogspawn that was deposited over-night. Spawning for the rest of the frogs started on 23 February, and ended on 5 March, so this is a real surprise, and has not happened before in this pond. 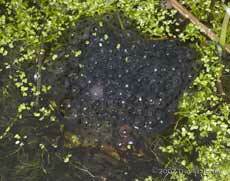 The well developed tadpoles swimming next to it emphasise just how late this spawn is. 17 April - We really do need some rain soon if I am to avoid topping up the pond again. Two weeks earlier than in 2005/6 the moth-like fluttering of a dark insect over the pond marked the first appearance of the year by a Rhadinocerea micans. 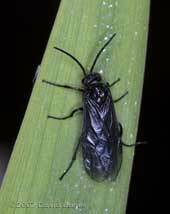 This is a sawfly that is completely dependent on the Flag Iris which is the food plant for its larvae. I wonder if this is a new arrival or if it has metamorphosised from one of last year's larvae.